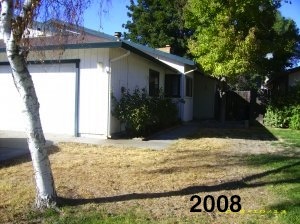 The property was empty for about a year so with no water running the lawn was pretty dry by the time I closed in mid-November. Faithful watering has brought back most of the grass and thanks to a free lawn mower from the grandparents I keep it trimmed. Not so lucky was the willow tree and once a large branch cracked and broke off in 2009, I decided to cut it down before more damage could be done. The city also installed a new water meter in 2011 so they could actually accurately gauge and charge citizens for water. 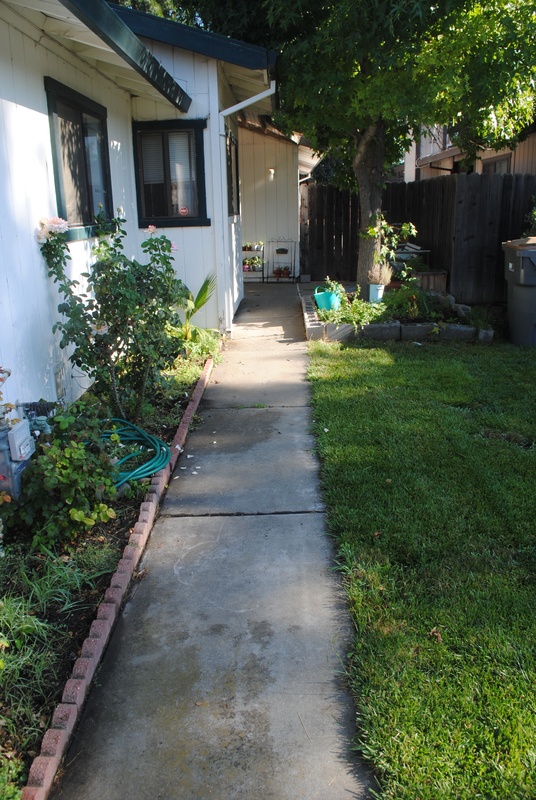 The front walkway is lined with rose bushes which were originally so overgrown they would attack visitors walking to the front door. 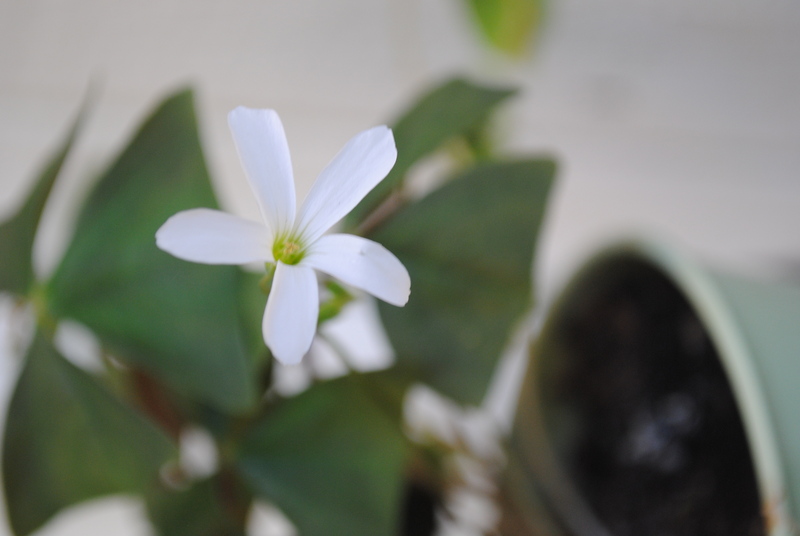 I fertilized the strip of land every year and now the flowers are thriving! I removed one rose bush and transplanted a fern in its place. 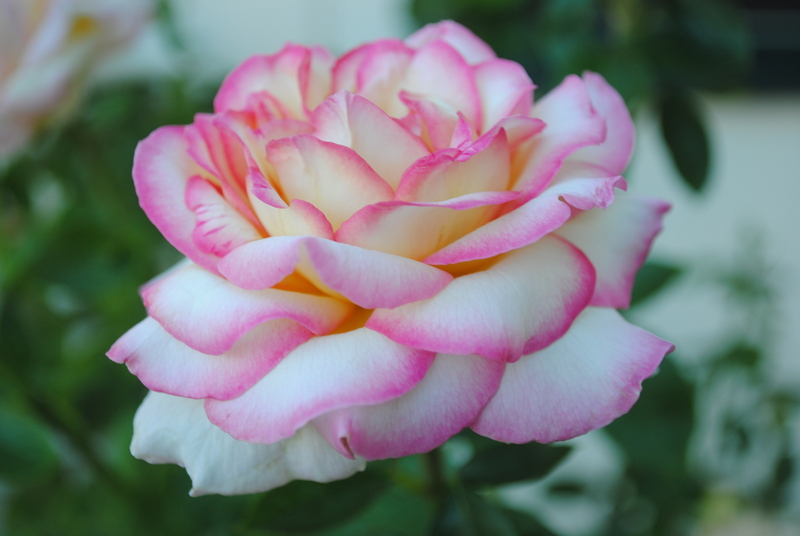 The roses are thriving and produce the most beautiful varieties. 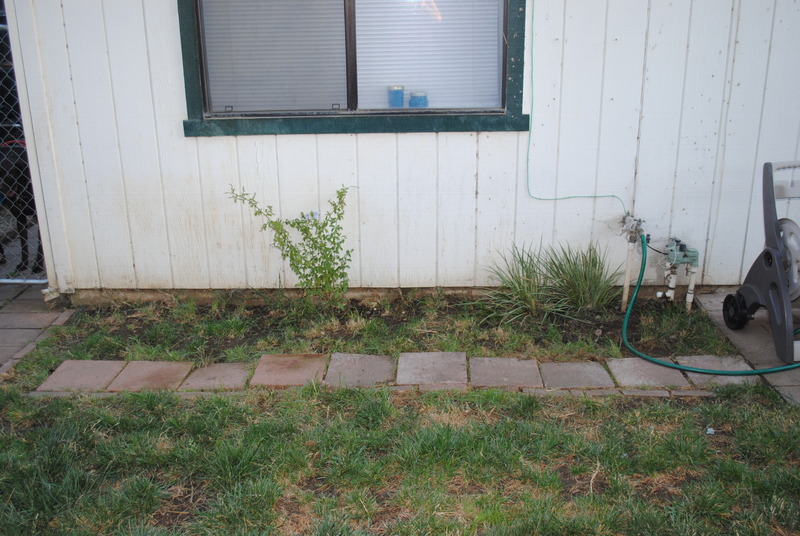 Since there’s so much space between the rose bushes, in some spots I created a layer of rocks. 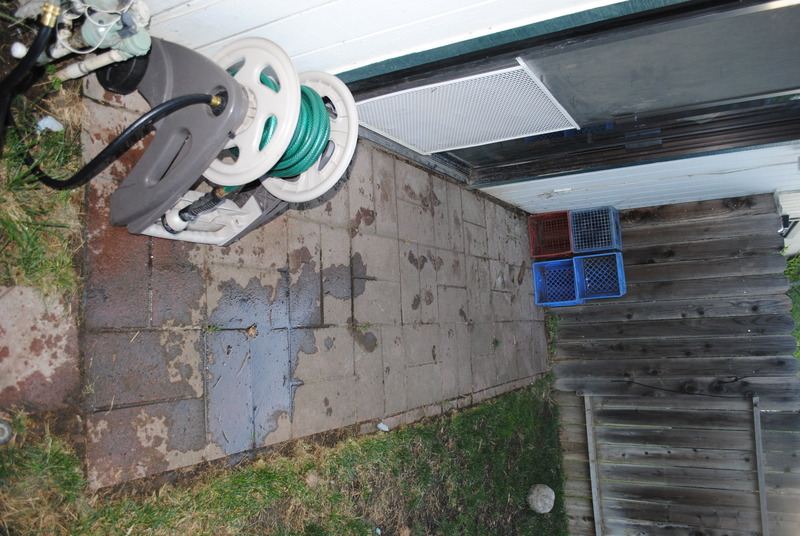 It’s a handy place to lay the water hose. Up closer to the house is my sugar maple tree. 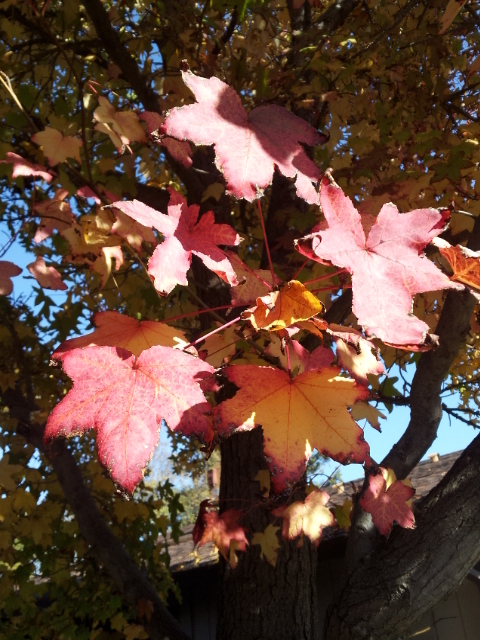 We’ve trimmed a few branches but it’s continued to grow and produces the most beautiful leaves year round. The plot here will be undergoing a revamp pretty soon and once again with lots of fertilizer and watering, the flowers have been thriving. Directly behind the maple and planter box is my front porch which is a space I completely overlooked when buying this place but is now a favorite spot of mine. It stays shady most of the day and I’ve slowly filled it in with furniture and flowers. 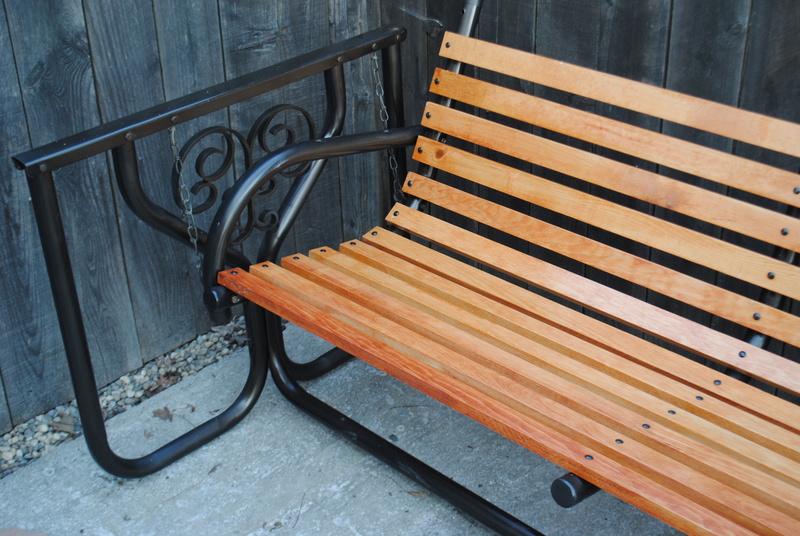 One of the first things I brought in was this swinging bench from my maternal grandparent’s home (wrote about it here) in 2009. 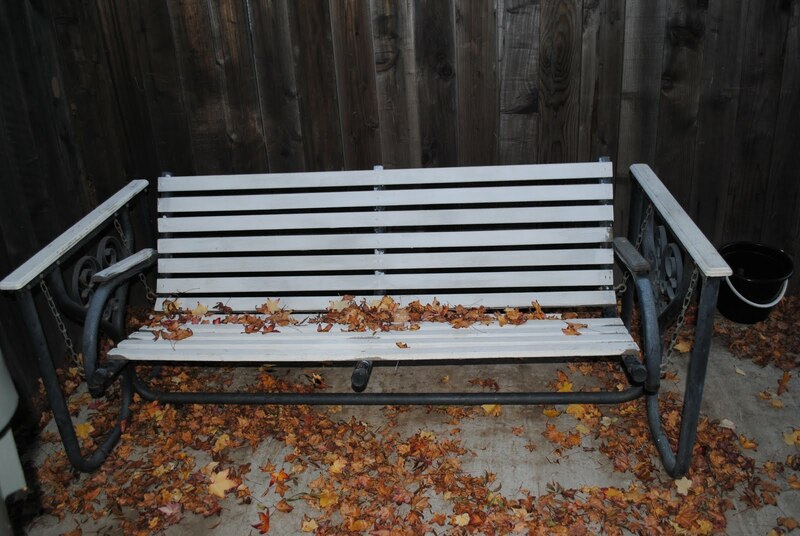 But since the wood on the bench was old, cracked, broken and one slat was missing I decided a revamp was in order. So I sanded down the frame, painted, replaced the wood and reassembled it in 2013. The bench isn’t always comfortable so I added these affordable pillows from Home Depot. 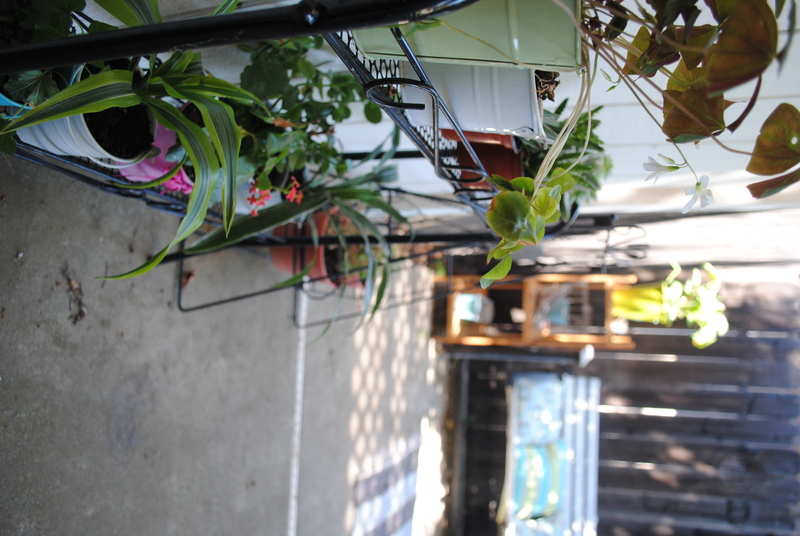 Also on the front porch are a square planter box, an open shelf from Goodwill, small white table and a new cart from Ikea. This plant stand gets filled every summer with new plants from the dollar section. I try not to spend a lot of money because I inevitably kill them. But I enjoy them while they last! 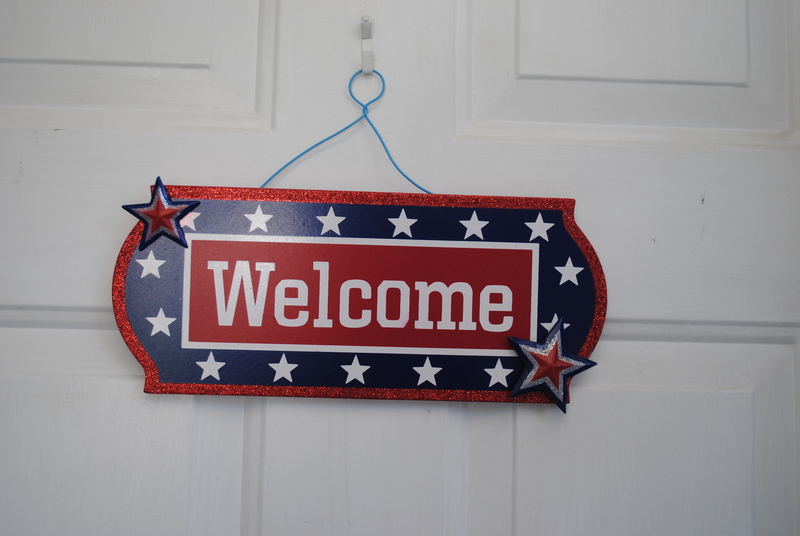 The front door has this handy little hook where I can hang wreaths and signs when I feel like it. The screen door has a lock but more importantly, a metal grate over the screen. The dogs love sitting on the tile and watching the front yard and that grate keeps them from knocking through the screen. 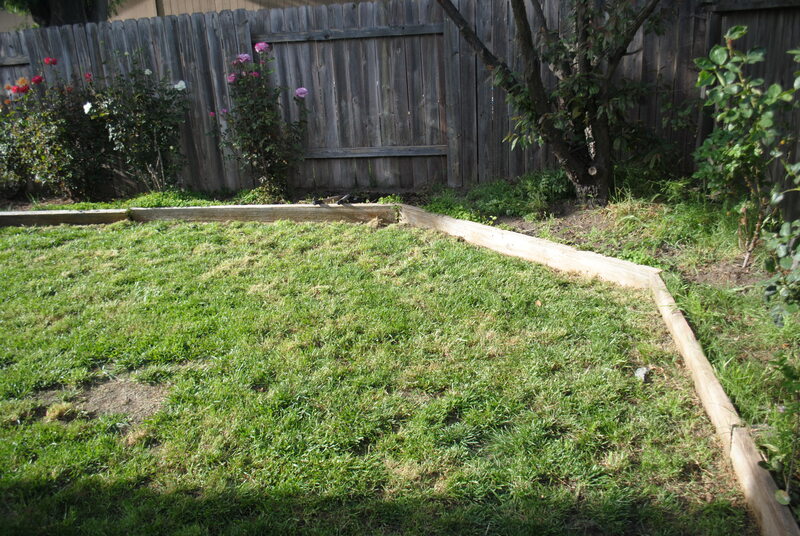 The backyard suffered the same problems as the front in the beginning. 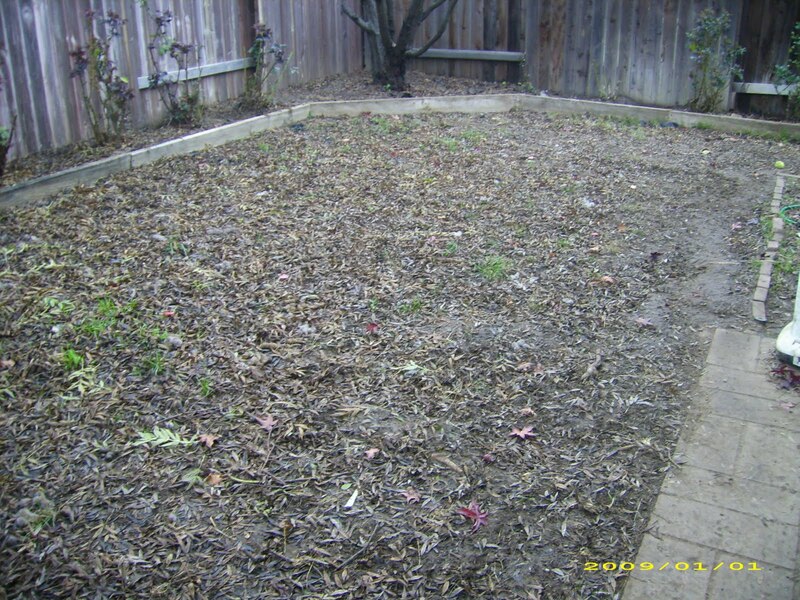 Lack of water had killed the grass and several of the rose bushes were dead or dying. Yeah, that’s what I stared with. Which was great until my dogs got out there! 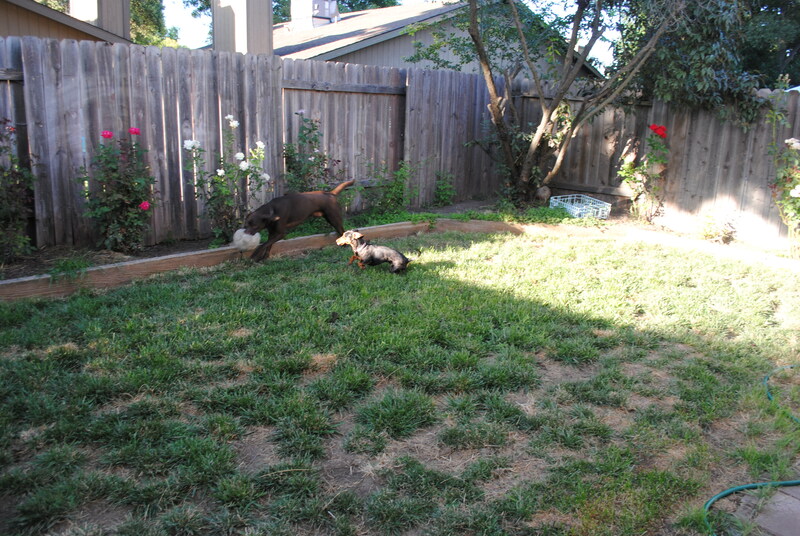 I have destructive dogs who like to play. And when they run and play on sod it gets torn up. 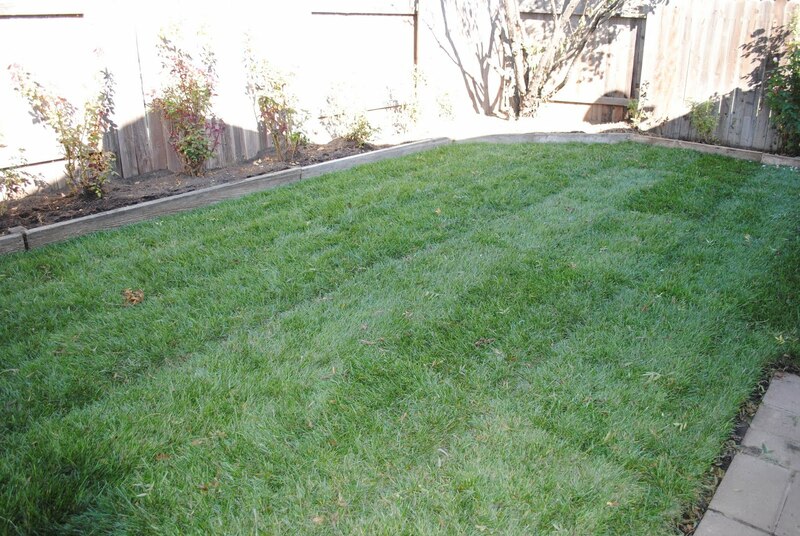 So while I’m constantly seeding, fertilizing and mowing, it looks pretty sad. 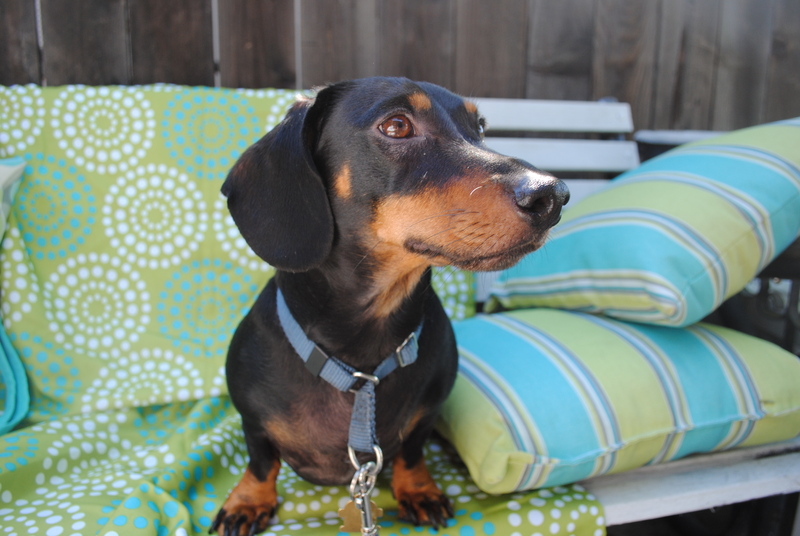 See dogs play? See grass die. Thankfully my Dad fixed the wiring and we programmed the sprinklers so they go off every morning at 6am, keeping the grass that has survived this long from shriveling up in the summer heat. Now if I can just keep enough moisture OUT that I don’t get a colony of mushrooms I’d be oh so happy. 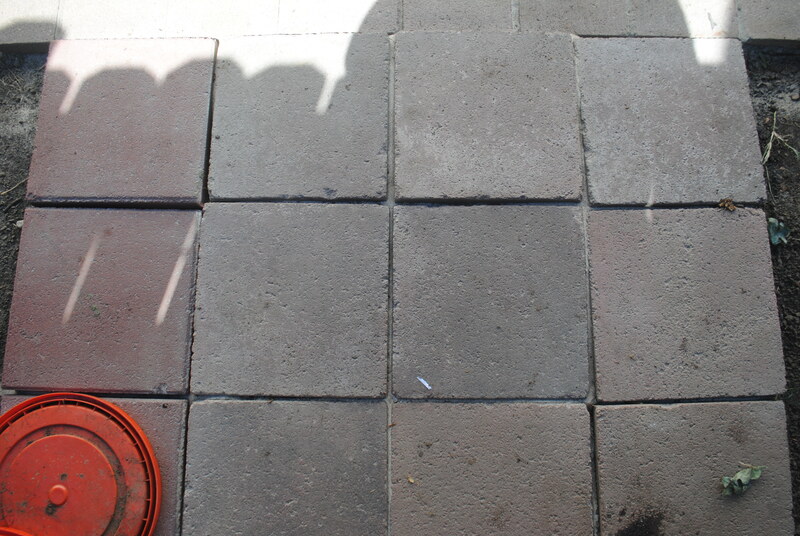 Right outside the master bedroom there’s this narrow patch of patio. 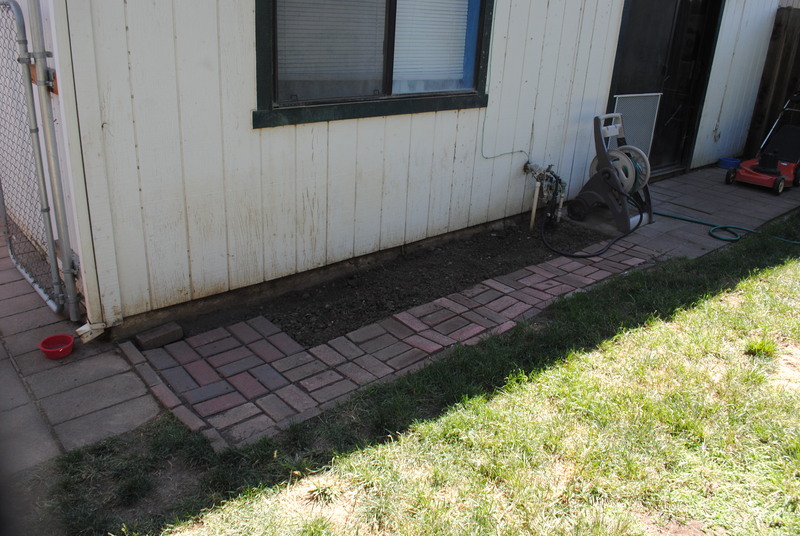 The gaps between stones will get filled with polymer sand and I’d like to pull out the bricks along the outside edge so the grass grows right up to the edge. 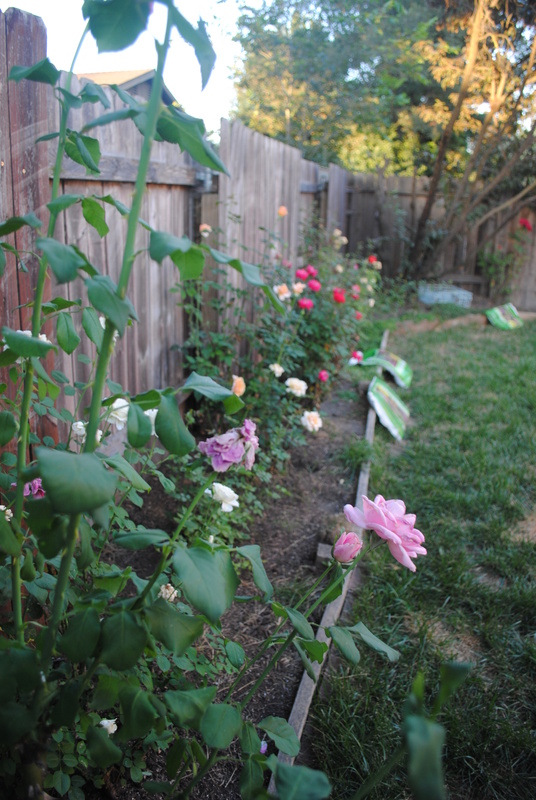 The roses that surround the yard here are decently healthy, I only had 3 out of 12 that needed to be dug up. We took out the boards and buried brick border, stacked up the paver stones and glued them in and then took out the dead tree in the corner. 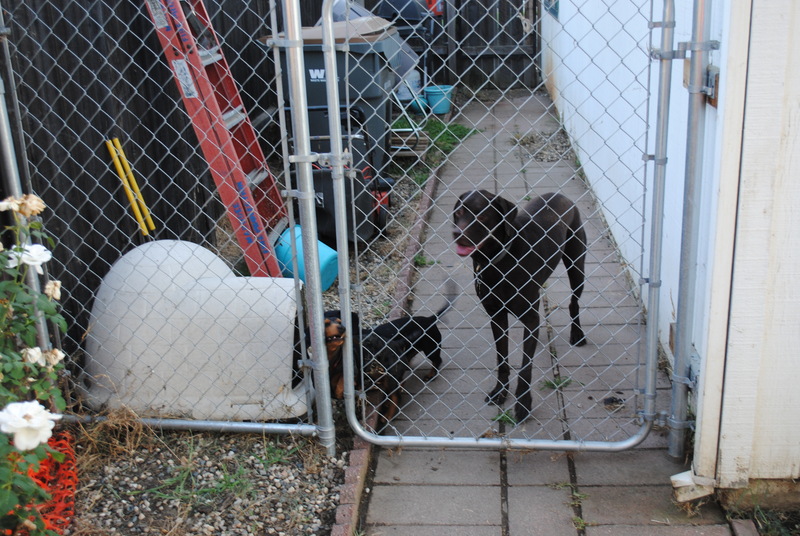 The side yard is divided by a dog gate and chain link fence that Dad installed. 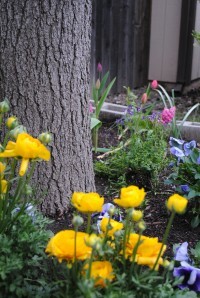 Pretty soon it will be off limit to the dogs so I can plant flowers without fear of destruction. 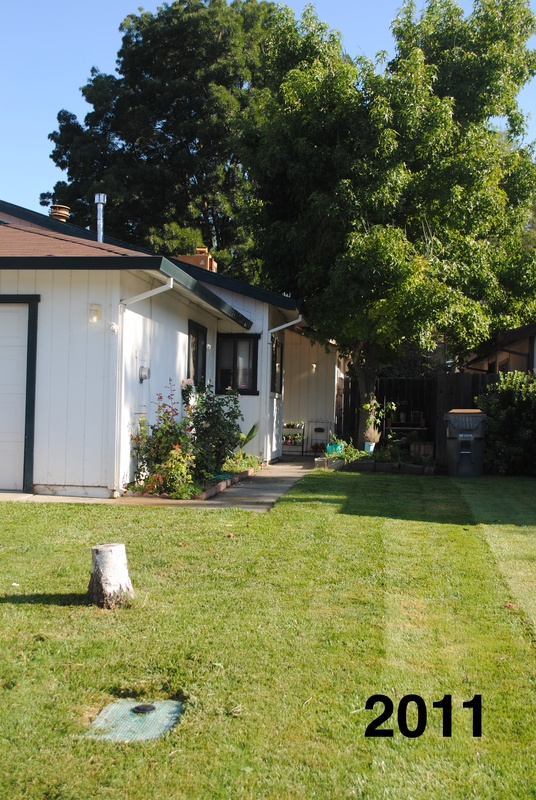 When I moved in the side yard was horrible. 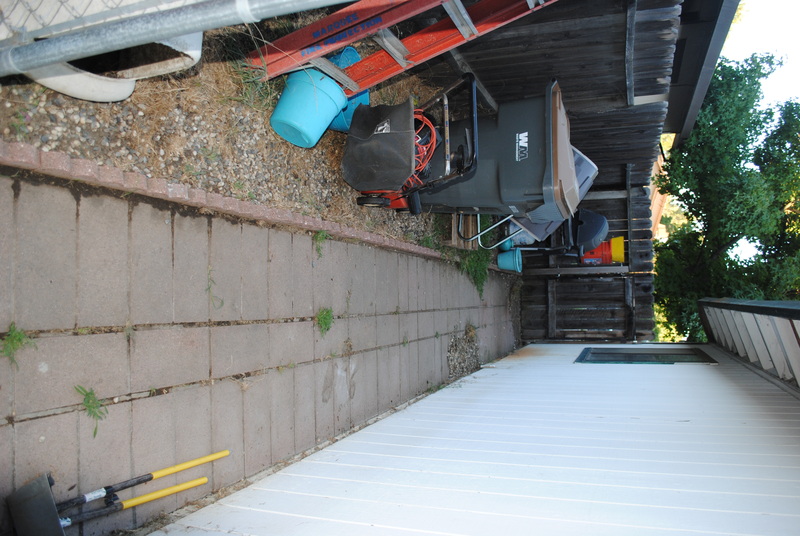 It became a dumping ground for stuff including trash cans, yard tools and empty flower pots. 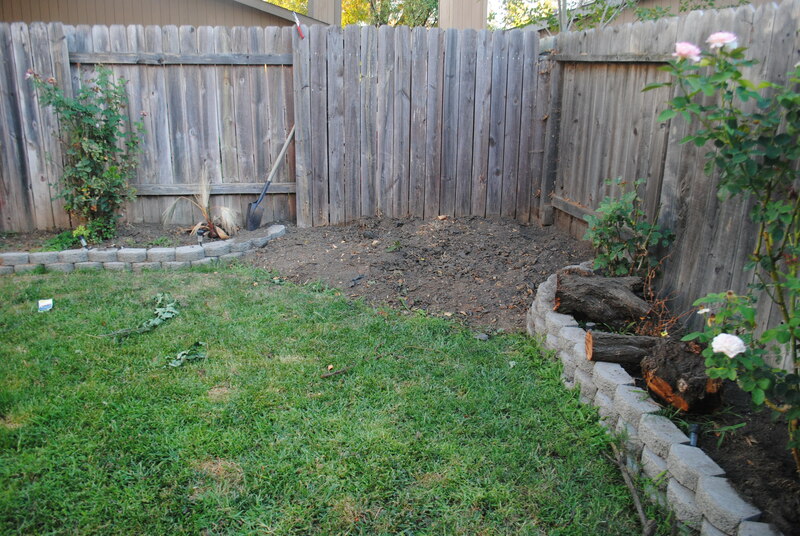 To start with a blank slate I paid a trash guy to haul away wood, an old cabinet, the scalloped border we pulled out and the layer of rocks and dirt. 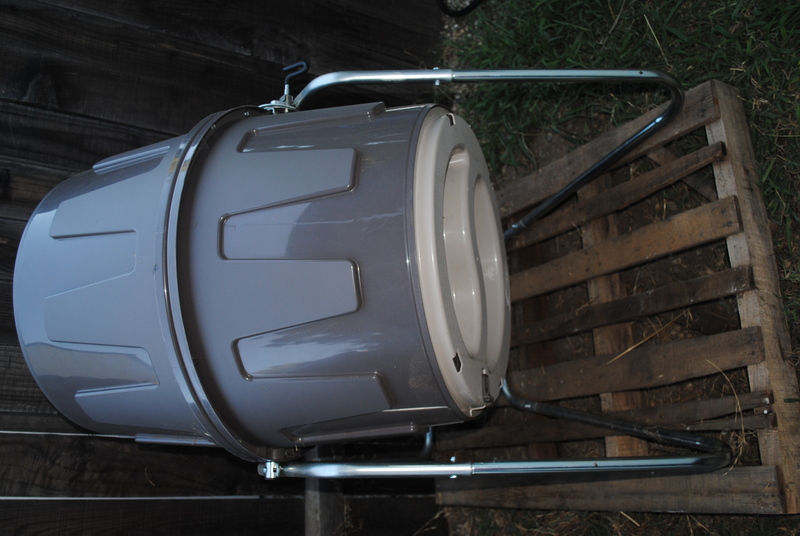 One thing that did stay was this compost barrel from Amazon which ended up being free after rebate from my city. 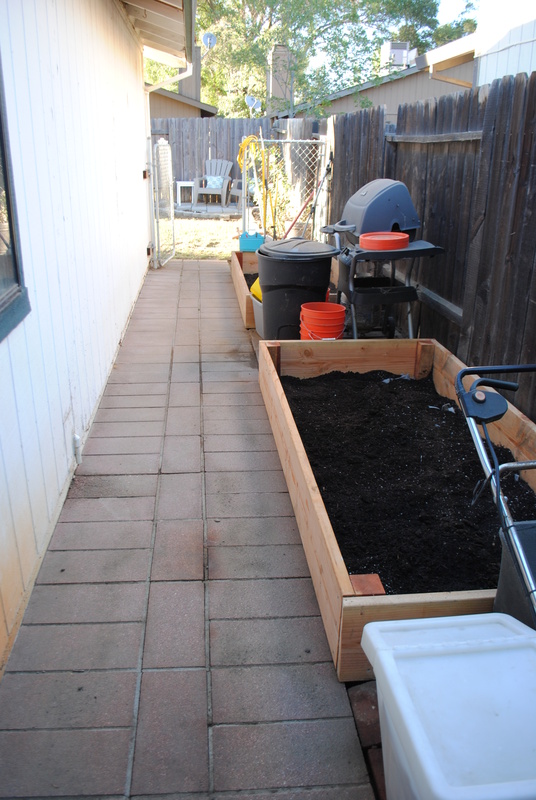 So far I’ve been throwing in dirt, leaves and kitchen scraps. 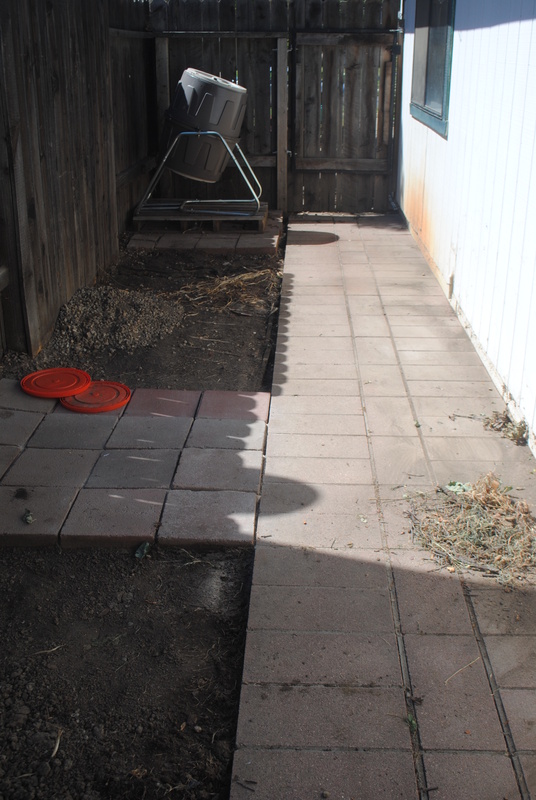 Since I wanted to keep the compost bin and gas grill on the side yard, I had my yard guy build 2 small patios from red bricks (4’x5′ and 4’x4′). It was a great solution after getting out all those rocks and junk. The cracks will get filled in with polymer sand and set in place. 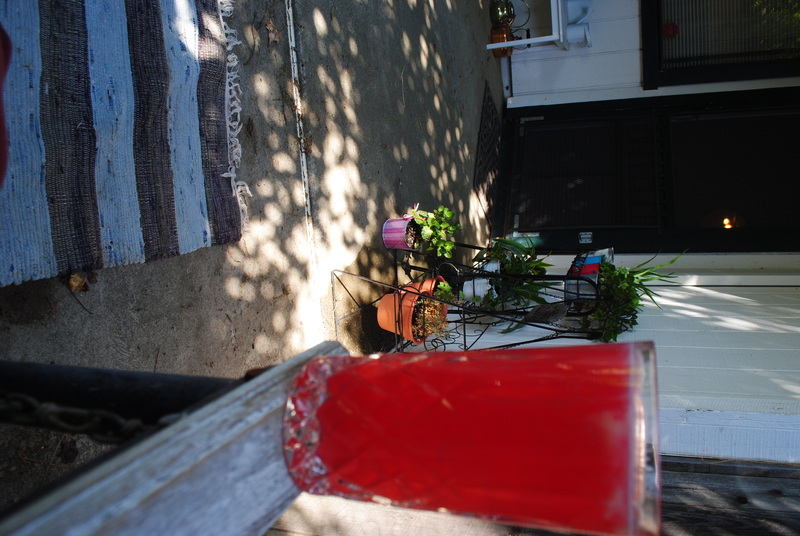 The gate swings open to the front porch! Kelly, Your progress is remarkable! It’s evident that you possess the insight to make great plans and the dedication to get the job(s) done.